The ANESTHETICBOXE system is designed for the safe keeping of narcotics, drugs and certains medical equipment used by anesthesiologist and surgeons. This system will provide a secure access controlled solution to the anesthetist’s lockerettes. The medication is contained in a box with patient’s name and a reference to the doctor/surgeon. This system will eliminate any possible mix-ups and avoid confusion as every door is assigned to a specific doctor/surgeon and ONLY the assigned surgeon can open his door. This system is both highly secure and easy to use. The pharmacist is provided a Master Proximity card to open all doors and to populate the medication to the assigned doctor/surgeon with reference to their patient. First, you must flash your Proximity card. Secondly, you must imput a code that will be assigned. Finally, the cabinet will open and the whole process will be recorded online to further increase security. 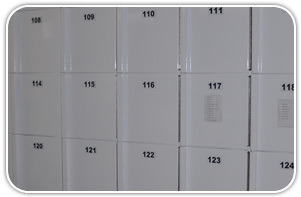 As the manufacturer, we are fully capable of customizing cabinets to fit your specific needs. The cost will vary depending on the amount of customization done on the cabinet.